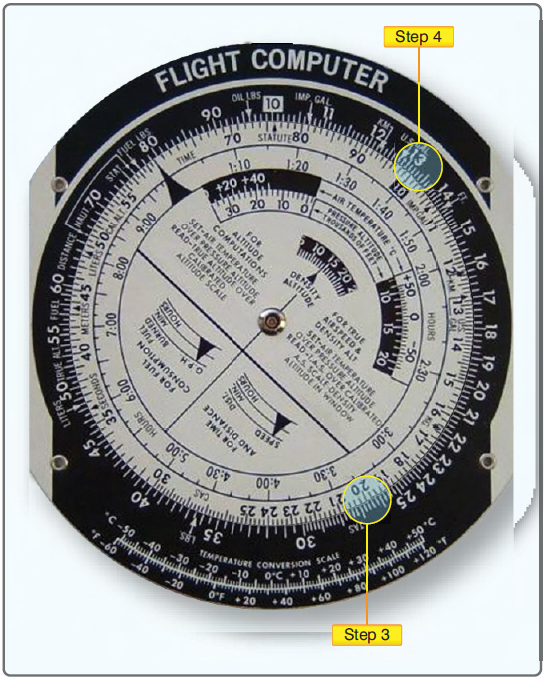 Determining the CG of an airplane in inches for the main-wheel weighing points can be done with any simple electronic calculator that has addition (+), subtraction (–), multiplication (×), and division (÷) functions. [Figure 10-1] Scientific calculators with such additional functions as memory (M), parentheses (( )), plus or minus (+/–), exponential (yx), reciprocal (1/x), and percentage (%) functions allow more complex problems to be solved or simple problems to be solved using fewer steps. Figure 10-1. 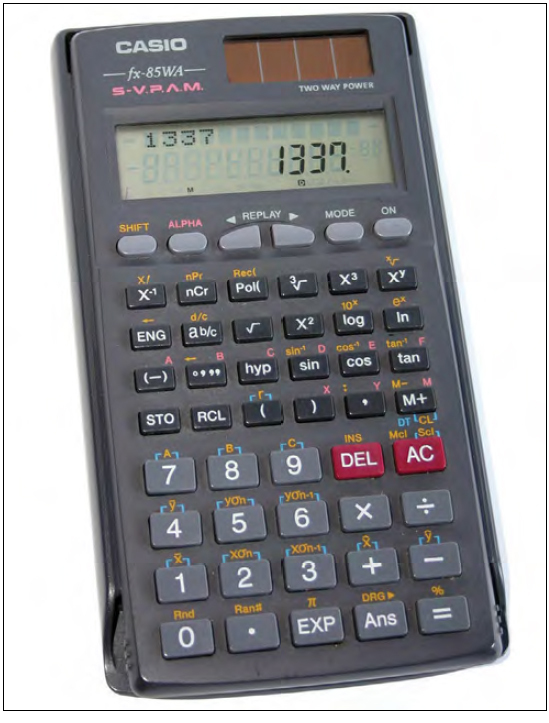 A typical electronic calculator is useful for solving most types of weight and balance problems. Figure 10-2. 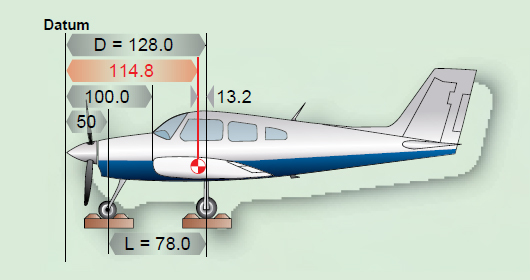 Weight and balance data of a typical nosewheel airplane. The arm of the nosewheel is negative, so the CG is –13.2 or 13.2 inches ahead of the main wheel weighing points. The E6-B uses a special kind of slide rule. Instead of its scales going from 1 to 10, as on a normal slide rule, both scales go from 10 to 100. The E6-B cannot be used for addition or subtraction, but it is useful for making calculations involving multiplication and division. Its accuracy is limited, but it is sufficiently accurate for most weight and balance problems. Figure 10-3. E6-B computer set up to multiply 340 by 78. Step 1—place 10 on the inner scale (this is the index opposite 34 on the outer scale that represents 340). Figure 10-4. E6-B computer set up to divide 26,500 by 2,006. Step 3—on the inner scale, place 20, which represents 2,006 opposite 26.5 on the outer scale (26.5 represents 26,500). Step 4—opposite the index, 10, on the inner scale read 13.2 on the outer scale. Determine the value of 13.2 by estimating: 20,000 ÷ 2000 = 10, so 26,500 ÷ 2,006 = 13.2. The arm (–78) is negative, so the CG is also negative. The CG is –13.2 inches or 13.2 inches ahead of the datum. Dedicated electronic flight computers, like the one in Figure 10-5, are programmed to solve many flight problems such as wind correction, heading and ground speed, endurance, and true airspeed (TAS), as well as weight and balance problems. 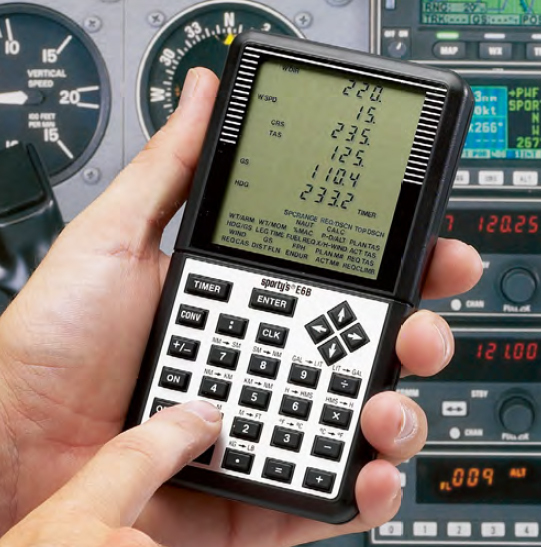 The problem just solved with an electronic calculator and an E6-B can also be solved with a dedicated flight computer using the information shown in Figure 10-2. Each flight computer handles the problems in a slightly different way, but all are programmed with prompts that solicit the required data to be inputted so there is no need to memorize any formulas. Weight and arms are inputted as called for, and a running total of the weight, moment, and CG are displayed. A hand-held electronic calculator like the one in Figure 10-5 is a valuable tool for solving weight and balance problems. It can be used for a variety of problems and has a high degree of accuracy. The examples given here are solved with a calculator using only the (×),(÷),(+),( – ), and (+/–) functions. If other functions are available on your calculator, some of the steps may be simplified. Figure 10-5. Dedicated electronic flight computers are programmed to solve weight and balance problems, as well as flight problems. 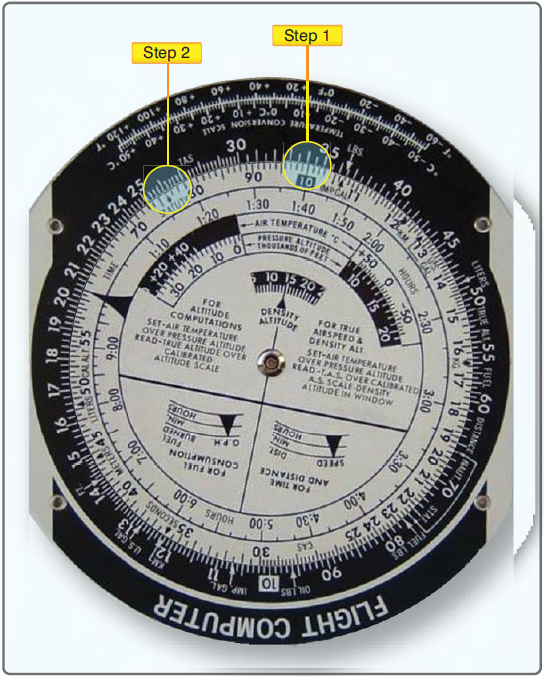 This type of problem is solved by firs determining the location of the CG in inches from the main wheel weighing points, then measuring this location in inches from the datum. There are four types of problems involving the location of the CG relative to the datum. 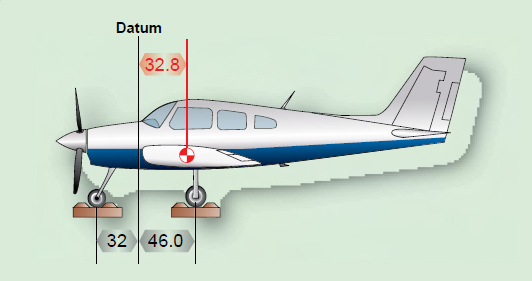 The datum (D) is 128 inches ahead of the main wheel weighing points; the weight of the nosewheel (F) is 340 pounds, and the distance between main wheels and nosewheel (L) is 78 inches. The total weight (W) of the airplane is 2,006 pounds. Refer to Figure 3-5. The CG is 114.8 inches behind the datum. The datum (D) is 75 inches behind the main wheel weighing points, the weight of the nosewheel (F) is 340 pounds, and the distance between main wheels and nosewheel (L) is 78 inches. The total weight (W) of the airplane is 2,006 pounds. Refer to Figure 3-6. Figure 3-6. The datum is located at the firewall. The minus sign before the parenthesis in the formula means the answer is negative. The CG is 88.2 inches ahead of the datum (–88.2). The datum (D) is 7.5 inches ahead of the main wheel weighing points, the weight of the tailwheel (R) is 67 pounds, and the distance between main wheels and tailwheel (L) is 222 inches. The total weight (W) of the airplane is 1,218 pounds. Refer to Figure 3-7. Figure 3-7. Determining the CG. Determine the CG in inches from the main wheels. The CG is 19.7 inches behind the datum. The datum (D) is 80 inches behind the main wheel weighing points, the weight of the tailwheel (R) is 67 pounds, and the distance between main wheels and tailwheel (L) is 222 inches. The total weight (W) of the airplane is 1,218 pounds. Refer to Figure 3-8. Figure 3-8. The datum is 100 inches forward of the wing root leading edge. The CG is 67.8 inches ahead of the datum.